As the heat turns up, our taste preferences change to fresher, lighter and quicker dinners. 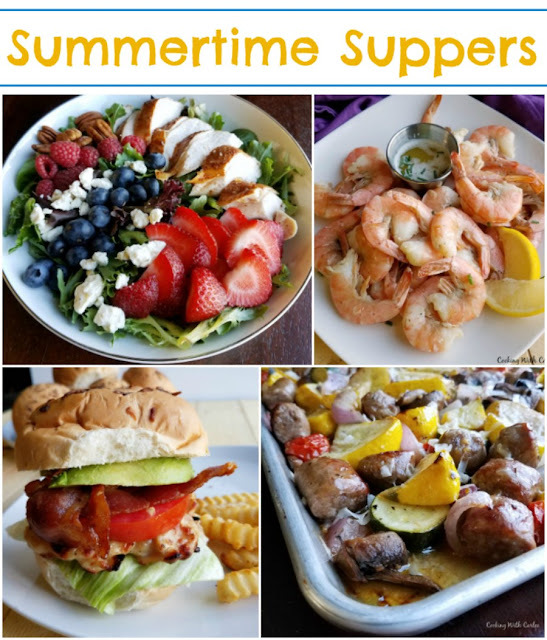 Here are some of our favorite summer dinner ideas! Spring was a little late to arrive this year. I'm not sure if the warmer weather got held up in the TSA line or maybe it was just enjoying its stay in the southern hemisphere? No matter where it was, it came in roaring. It didn't seem like we had much of a transition. There were layers and goosebumps one day, and heat and humidity the next. The arrival of warm weather usually signals the begining of hibernation season for our soup pots and casserole dishes. When the air is running non-stop, baking a casserole in the oven for an hour just has less appeal. So it's time to grab the charcoal and tongs, the salad bowls and sandwich fixings. Lighter, brighter and fresher is just around the corner. So here are a few summer dinner ideas to get those creative juices flowing. 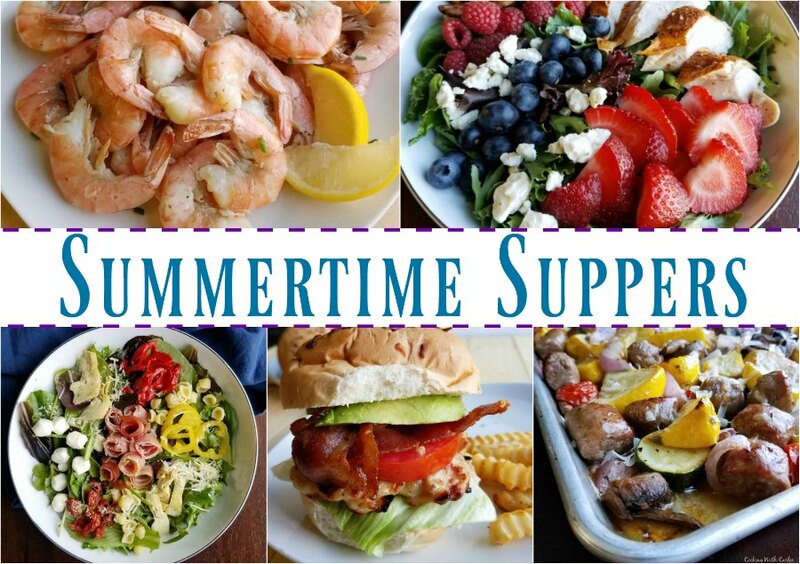 What are your favorite summer dinners? This sheet pan supper is LOADED with great veggies that you are likely to be harvesting or finding at farmers markets all summer long. 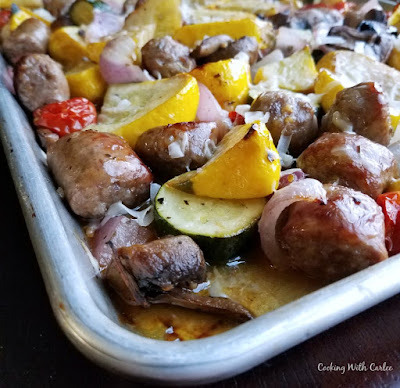 Italian sausage and summer veggie sheet pan supper is perfect on it's own, but we like to serve it over pasta or rice for a complete meal. A lot of people think of fall and winter food when they think of slow cookers, but they are actually great during the summer. You can cook dinner while you enjoy the great outdoors, plus they don't heat up the whole kitchen! 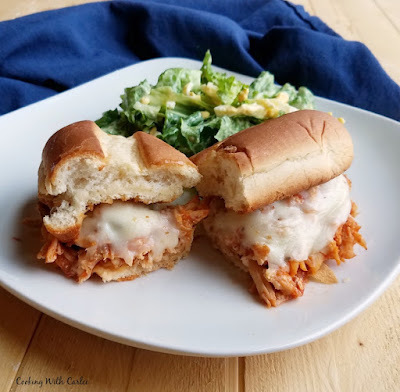 These slow cooker chicken parm sandwiches are a family pleasing meal! Of course the grills and fire pits are out this time of year. 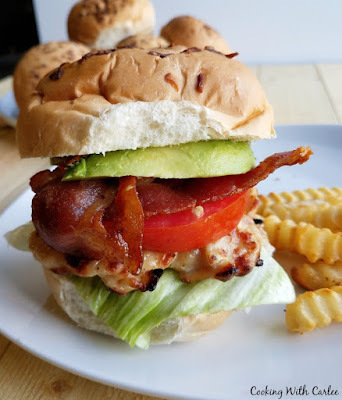 So these campfire chicken BLTs are the perfect thing to put on them. We like ours with a little avocado or honey mustard on them! Berries and salads are summer staples. 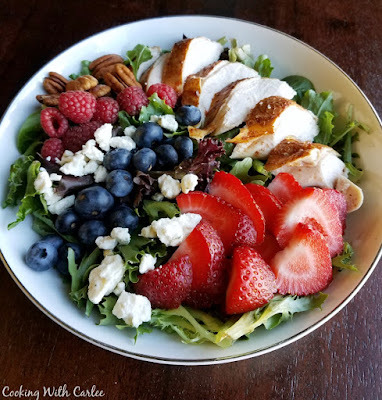 This red, white and blueberry salad is loaded with some of my favorite salad toppings. It makes for a perfect light dinner you can feel good about eating! 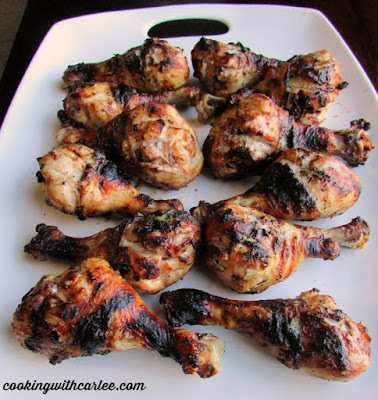 This lemon and yogurt marinated chicken is so moist and flavorful. It is definitely one of our go-tos when we feel like grilling. Everyone who has had it instantly falls in love! 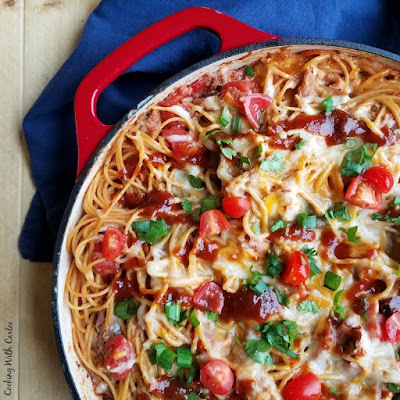 Of course summer is the season for leftover pulled pork, so I would be remiss if I didn't add this creamy pulled pork spaghetti recipe to the list. It is the perfect way to change up those leftovers and turn them into a new meal! 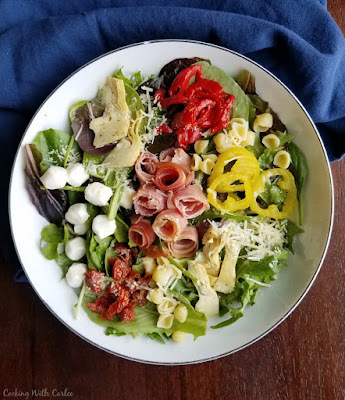 An antipasto salad is another fresh dinner possibility. It is so full of flavor and super easy to make too! 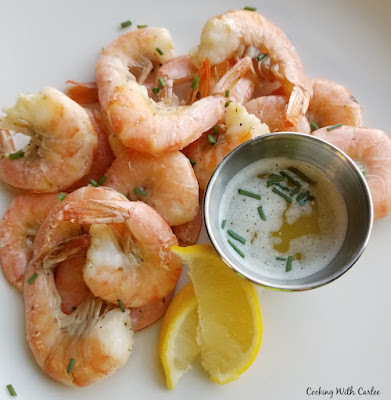 Roasting shrimp is a quick and easy way to get dinner on the table as well. These key lime roasted shrimp have that citrus kick that make them extra special. I highly recommend making key lime butter for dipping them too! 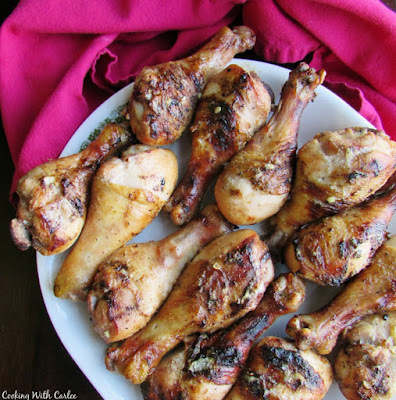 While we are on the subject of citrus and kick, these tequila lime chicken drummies are delicious! You could of course do chicken breasts this way as well. Maybe slice them and serve them on a Mexican inspired salad?! Napa salad turned up as a side dish at many holiday dinners in my childhood. But I like serving it as a nice fresh summer supper with chicken on top. 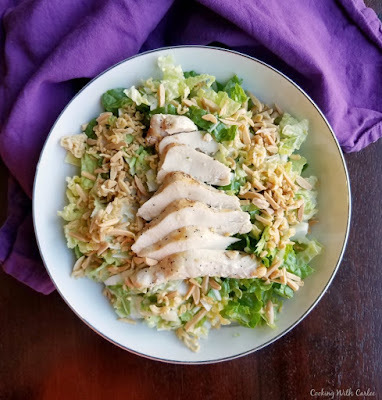 If you aren't eating the whole batch in one evening, just reserve some of the dressing and put the extra crunchies in an airtight container and make little salads to bring to work with you during the week! We are home from Chicago and having a family cookout today, I still need a side and now your catalog of goodness has arrived at the perfect time!! Have a GREAT day...stay cool; hard to believe I am saying that, lol! Perfect timing! I hope you had a blast! So many ideas - so little time - right!?! Thanks for the summer dinner ideas. I love Summer and even some of the cooking that goes with it. Thinking of something to cook is always the challenge! That is always the hardest part for me as well! Hi Carlee, as our lump of pork cooks in the halogen, I'm rather fancying your antipasto salad! SO many great summer recipes! Pinning! Thanks so much for sharing at Whimsical Wednesdays Link Party! It never hurts to have a little inspiration! That Italian sausage & veggie sheet pan dinner was one of my favorite new recipes tried last summer. I can't wait to make it with all of my garden veggies this summer. I am looking forward to that too! The zucchini wave should be hitting any minute! These all look like great summer meals, but that salad is perfection!